Welcome to the latest in this behind the scenes series, A portrait of Thame, where this time I visit Jolly Brew to create a portrait for Thame Hub. Jolly Brew are a reasonably new business in town. Situated just a short walk from the main high street shops Greg has set up shop at number 1 East Street. The shop could best be described as bijou but packed full of delicious smelling teas. As well as a classic English Breakfast Tea, Jolly Brew sell a whole range of 50 different teas of various flavours including a peppermint tea and a smoky Lapsang Souchong which reminded me of sitting around a campfire. Additionally, despite the company name, Jolly Brew also sell coffee both as beans and ground. 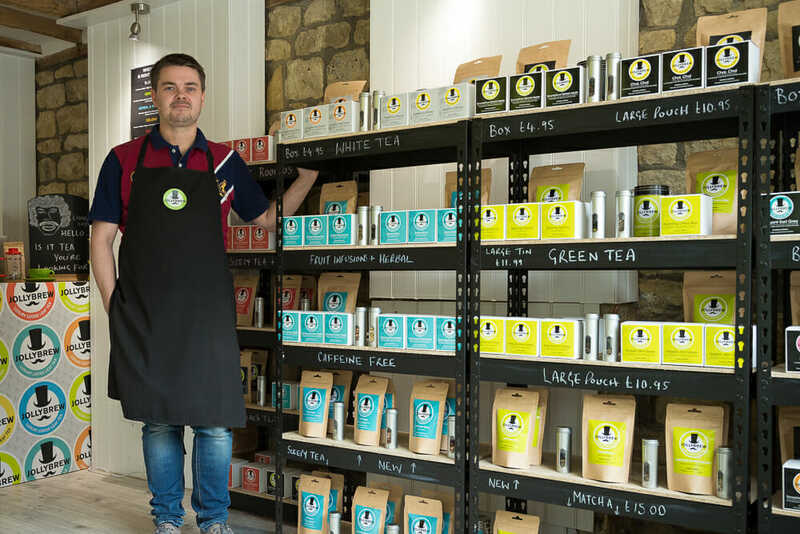 Importantly though all of Jolly Brew’s products are ethically sourced and they are currently working towards recognition with both Fair Trade and the Ethical Tea Partnership. For the image of Greg you see above we agreed that it was important to feature some of the packets of teas, which brought some vibrant colour into the image. As it was a nicely bright but overcast day that was providing an even light from camera right, I didn’t need to use flash on this image. This image was taken by the door to the shop and from a low down angle to create the sense of height and help fill the frame. While I was there to photograph Greg we had a great long chat about business and what it is that drives him to get up in the mornings. I could tell just from talking to Greg that his passion for the business is second to none and I wish him and Jolly Brew all the best.